For such a major figure in the early Vancouver sports scene, the details are few and far between on Con Jones. Nothing is known of his early life except that he was born on August 18, 1869 and originally hailed from the Woollahra suburb of Sydney in New South Wales. Some accounts say Jones had been a bookie in his native Australia – others say that he later became a bookie here. What is known for certain is that he arrived in Vancouver in November 1903 and in the years that followed, he opened up a tobacconist’s, the Brunswick pool hall, some bowling alleys, and a café. 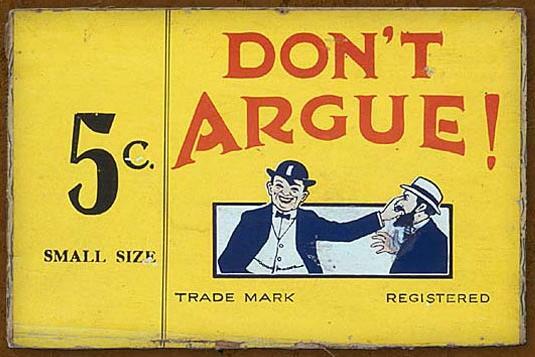 Jones marketed his tobacco under the brand name of “Don’t Argue”, which had one of the most unique business logos ever: a guy in a bowler hat confidently muffling another man in the face. The store motto was “Don’t Argue, Con Jones Sells Fresh Tobacco” and it may have featured the first neon sign in Vancouver – sporting his famous “Don’t Argue” logo. There is strong evidence hinting that Jones surreptitiously “borrowed” the slogan and imagery which was also used by Hutton’s Hams & Bacons in his native Australia. Within two years of his arrival he became one of Vancouver’s leading sports promoters. Jones started out with billiards; one of his first promotions was offering up a trophy for the BC Amateur Championship in May 1904 – but his first loves would become soccer and lacrosse, and he would spend big bucks to promote them both. His association with lacrosse begun around 1907, possibly sooner, and Con Jones was a key influence in the formation of the British Columbia Lacrosse Association pro league in 1909 (no relation whatsoever to the modern BCLA provincial organisation). Two years later he lured lacrosse star ‘Newsy’ Lalonde to Vancouver in 1911 by offering him $3,500 to $5,000 for a single season, an astronomical sum for its day. (The actual amount Newsy earnt varies depending on sources). 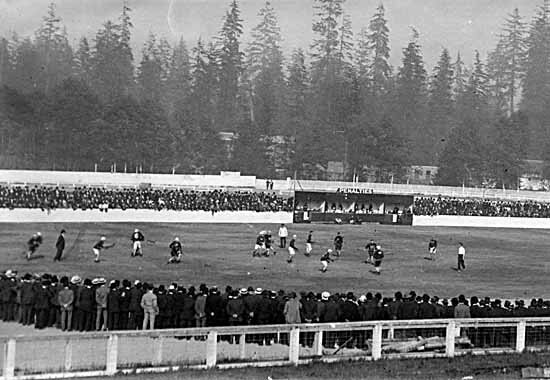 Around 4,000 spectators showed up to witness Vancouver’s debut at Hastings Park on May 31, 1913. Across the road from this site, Con Jones would later build the stadium that would bear his name. Jones loved sports so much he built his own stadium on the two-block Hastings athletic grounds that were located on Renfrew Street across from the PNE grounds. His lacrosse team vacated Recreation Park downtown and moved to the athletic grounds in 1913, and Jones would later construct a grandstand, which soon acquired the name ‘Con Jones Park’. Today the site is called Callister Park – although his wooden stadium is long gone (demolished in 1971). As well as benefiting the professional game, he helped build the amateur game at a local level by donating sticks and equipment to youngsters in the public schools. After running into a scheduling dispute with New Westminster in July 1913, the Salmonbellies walked off the field in protest. Jones pulled the plug on his Vancouver team, refunding $5,000 in ticket revenue to disappointed fans as the sport skidded into the doldrums. He would return to lacrosse in 1915, after the Vancouver Athletics had floundered the year before as a replacement for his old club. However, Jones himself would soon fall into financial difficulties. With the Vancouver club mired in debt to the amount of $2,300 just two months into the season, Jones showed his accounting books to the Vancouver players and stated he would not be paying them for the rest of the season. The three Easterners that he had imported in for the 1915 season packed up and left for home the following week. The Great War would then make the 1916 and 1917 lacrosse seasons two of its many casualties as play was suspended due to the war effort. By the time pro lacrosse was revived in 1918, it had lost its primacy in the hearts of Vancouver’s sports fans. Jones’ own interest in the pro game would sour again after the 1918 season when his Vancouver team won the Mainland Lacrosse Association and claimed the Minto Cup. However, the New Westminster Salmonbellies then claimed the following year – conveniently after they had lost the cup series – that they had never fielded a team and rejected Vancouver’s claims for the Minto Cup. While the early 1920s would see the game regain some traction amongst fans, it never flourished at the same dizzying level as it did under Jones’ heyday during the decade prior. In the meantime, out of disgust with the recent situation with New Westminster, Jones turned his attention to supporting the amateur game. When he returned to the professional game in 1921, what seem like a repeated occurrence over the years, constant disputes with the Salmonbellies, struck yet again. 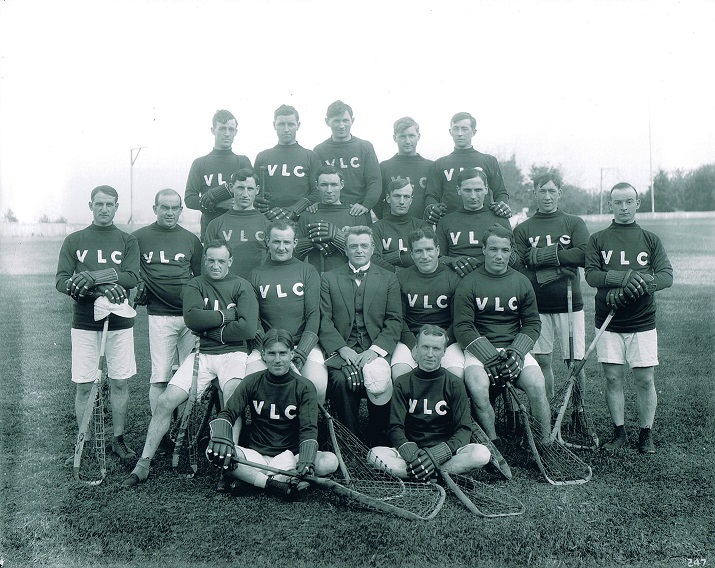 New Westminster refused to play against a Jones team, so this time Jones simply walked with his players and formed his own new league, the Pacific Coast Lacrosse Association, with Victoria as the token opposition. But his new venture was short-lived and floundered after just 5 games. Despite importing easterners to stock the teams, Victoria was hopelessly outclassed and the PCLA quickly proved futile. Jones found himself returning to the British Columbia Lacrosse Association in 1924 after coming to an agreement with New Westminster over organisation for the upcoming season. Sadly, just as Con Jones had a hand in building up the professional game in Vancouver, he would have a hand in its demise in that city, and ultimately in Canada – as its last bastion was on the Pacific Coast. In June 1924, four games into the season, Jones suddenly and without warning threw in the towel. Like a “bolt from the blue”, as one newspaper commented, Jones was forced to quit the game on his doctor’s orders. When local baseball legend Bob Brown then offered to step in and take Jones’s place leading the Vancouver club, the rescue attempt was quickly quashed when Jones flatly refused to allow his park to be used free of charge to help keep the national game alive. As the Vancouver Province stated: “And that’s that. Con Jones is through.” – and so died the last remnants of the pro lacrosse game in Canada. Jones was watching a soccer game at Con Jones Park when he suffered a stroke. Five days later, he suffered another attack and passed away at nine o’clock in the morning of June 3, 1929 at the age of 59. He was survived by his wife, four sons, and a daughter. His mausoleum is located at Ocean View Cemetery in Burnaby, British Columbia. In 1965, in recognition of his status as a builder of the game, Con Jones was named one of the charter inductees in the Canadian Lacrosse Hall of Fame.